Mitakihara University's signature event returns this week to campus: the annual Homecoming Week, celebrating the storied history of Mitakihara University Athletics and a celebration of the unique traditions that define Canada's premier urban research university. This year's Homecoming Theme is "A University For The Free World." Senior liberal arts major and MadokASI Vice President Fuuko Kurasaki reprises her role as the Homecoming Committee Chair for one final year and was excited, as usual, when asked about this year's Homecoming Week. "This is a very special homecoming for me because it is the last-ever time I will chair a Homecoming Week," Kurasaki said. "I plan to make this one of the best homecoming weeks Canada has ever witnessed. This year, we are saluting Neil Young and his legacy, while at the same time, honoring our role as a university for the free world. "We believe in freedom, liberalism and capitalism, while at the same time advocating social justice and the promotion the basic human rights of every citizen. Many political science majors at Madoka have gone to illustrious careers in politics around the world, changing cities and nations for the better. "We salute these facets this year on Homecoming Week and hope that peace throughout the world forms the gold standard for living your life in the 21st Century." A number of events will take place leading up to the Homecoming Game against the Air Force on September 27, 2053 at 6:00 p.m. PT/9:00 p.m. ET. The game will be televised by City, TVA Sports, The Mtn., NHK and BBC. Special Exhibit at Saito Library: The Legacy of Neil Young. For more information, please visit the Saito Library website. Following the Women's Volleyball game vs. the British Columbia Thunderbirds, the 2053 Mitakihara Magi Football Team will be introduced. Speeches by head coach Tatsuya Kaname, offensive team captain Takumu Mayuzumi, defensive team captain Jeff Nakazawa, athletic director Mami Tomoe and university president Homura Akemi will be made. 5:00 - 8:30 a.m. - Breakfast at the Dorms - Passport holders are invited to enjoy a hot breakfast at the dorm of their choice. Pay at the door (cash please), cost is $15 per person. Pack a picnic and set up a tailgate with your friends prior to the Mitakihara-Air Force football game. The Madoka Tailgate Area will be located inside Gate 13. Cars can park here for $30, payable on-side. Tailgate is permitted for 2 hours prior to kickoff and for one hour following the game. More information can be found at the Athletics website. Cheer on the Mitakihara Magi as they take on the Air Force Falcons. 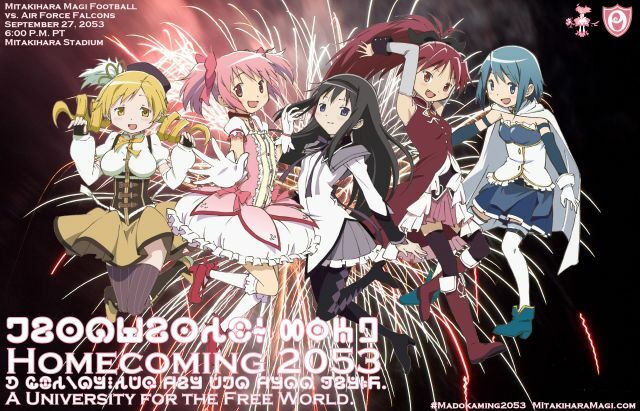 A block of tickets for Madoka Homecoming is currently reserved through the Mitakihara Athletic Ticket Office. Tickets are required and cost $18 each, children ages 12 and under are free. Tickets can be purchased directly through the Mitakihara Box Office by phone at (250) 4MADOKA or online at the box office website.